Boon Tong Kee: Best Chicken Rice in Singapore? Chicken rice is one of the must-eat Singapore Food. Naturally, there are many places serving this popular dish around the island, you can find it in almost every coffee shop and hawker centre. 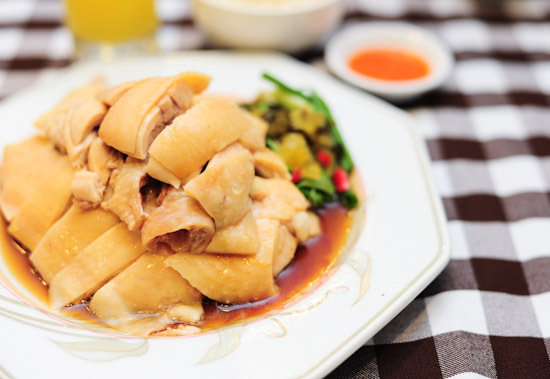 When it comes to the best chicken rice in Singapore, most people will definitely think of Wee Nan Kee, Tian Tian Hainanese chicken rice, and of course Boon Tong Kee chicken rice. Is Boon Tong Kee Chicken rice as good as before? Or has the standard dropped since the rapid expansion of the chicken rice chain? How do you define what is the best chicken rice? Everyone has different opinions on what is the deciding factor. For some, it is the chicken, while there are others who place a higher emphasis on the rice. For the rest, the chilli and garlic sauces are equally important, and will determine whether it is a plate of good chicken rice. You can’t fault Boon Tong Kee on any of those factors: the chicken is tender and tasty, the rice is fragrant and the chilli sauce is good enough to accompany them. But is this the best chicken rice in Singapore? While Boon Tong Kee is competent, there are other stalls which have equally good, if not better chicken rice at a cheaper price. There will be loyal supporters who have been eating Boon Tong Kee’s chicken rice for years, as well as critics who feel that the chicken rice chain is too commercialised. But the fact is Boon Tong Kee indeed has good chicken rice, and it helps that they have six branches around Singapore. Being a well-established brand, it is safe to bring your overseas visitors to Boon Tong Kee for their first taste of our famous Singapore chicken rice. Having said that, I probably will not think of Boon Tong Kee when I am craving for chicken rice – it is not a dining destination for me when it comes to this popular Singapore food. I am not sure if the standard varies between branches, but most people seem to agree that their River Valley and Balestier road branches serve the best chicken rice. Over priced, over-rated, bad service, oily, tough meat the list goes on. I prefer 5 star chix rice!!! i really enjoyed Boon Toon Kee, river valley food on my recent visit to Singapore F1 Grand prix 2011.i would have liked to use other dining facilities but this restaurantit was more convenient. the price was a bit high but worth it, i pay more for meals in Zambia anyways. i enjoyed the chicken dont know if its boiled or what and the peanuts i hope to get the recipe so i try it at home. I love chicken rice, esp the hainanese kind. In fact, I dislike the roasted, fried and lemon varieties. For me, my fav is Boon Tong Kee from Cheong Chin Nam Rd (off Upp Bkt Timah). I say it’s my fav cos it’s opened till late (sometimes past midnight) and they have excellent service. I hardly eat at the diner;I usually buy back. They have great telephone ordering service. Sometimes though, their rice is a little inconsistent (a little hard or soft at times, esp nearing closing) but I must say the chicken is more consistent. If you buy near closing time, the chef will usually give you a bigger portion in order to clear stock. It is a bit pricey buy value for money if you think about it. For a set at $4.15, you get the rice, chicken, sauces, pickles, chicken ball, well-designed and very good quality plastic cutlery, including serviette and wrapped toothpick. I’ve tried chicken rice from so many places, usually sold at between $3 – $3.50. I must say they are disappointing in terms of quality, taste and portion. Th worst Boon Tong Kee branch is the RV one. The rice is oily and the chicken not as tender. The one at Balestier is good too! There is one at Upper Thomson Rd (I donno the name) which is alongside a row of shophouses (opp Jalan Todak – when going to Sin Ming). They are a restaurant but serves vey good chicken rice and very reasonable. Their wanton soup is $2 for 4 huge pieces of wanton! If you wanna talkabout pricey chicken rice, I find the one at the basement of Bkt Timah Plazato be no value for money. The owner is rumoured to be the ex-chef of ChatterBox but over the years, the quality has really dwindled. A few years ago, the price was $9.90 per set – I donno what the price is now. Tis is one place to avoid. I was at the Boon tong Kee outlet (near Boon Keng MRT branch) today with my family. We were regular patrons of this outlet because the food was quite good and the location convenient. However, due to various reasons, we did not go to this restaurant for quite a while and there seem to be a lot of changes during this period of time. The food and the tea have become more expensive (they made changes to the prices for a menu which remain largely unchanged). The service standards also drop- The auntie serving us was a bit annoyed that we order so little at their busiest dinner-time- to be frank, we always order the same dishes to go with our chicken rice, I don’t understand the change in attitude. My mom kept saying that the chicken was tough and wasn’t as tasty as before. I had to agree. What the hell did she meant by that?! We are customers, and regular patrons. I am appalled by this kind of service standards. Last month at the flagship, birthplace of BOON which I ate since mid 80s. The chicken was not even their pride anymore. A senior waiter who took our order disgusted us (party of 6) when he claimed that their restaurant would not survived if they only chicken n stuff like several years ago. Waiter pushed hard for us to go seafood dishes. We insisted to have what we came for.. the chicken. Shocked n disappointed we were… The taste is off!! !